Today was Day #3 of Chocolate and Cheese Theme Week. Not all chocolates are sweet. 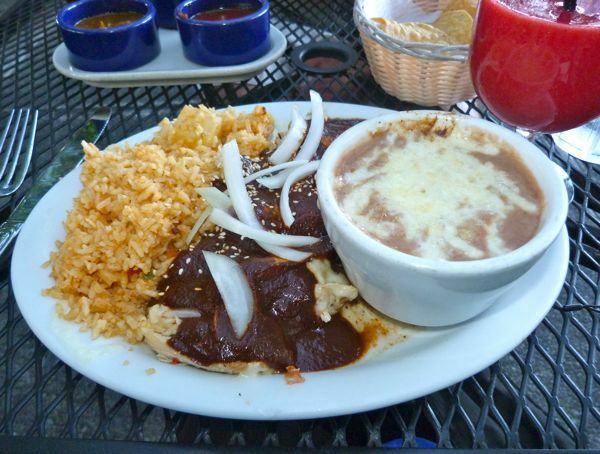 Mole sauce is a dark, flavorful, savory sauce made with ground chiles, herbs, nuts, seeds, and unsweetened chocolate. It is particularly delicious served atop vegetables or chicken, and is often served with cheese (queso). This evening I enjoyed a mole burrito plate at a favorite local restaurant, Fiesta del Mar (Mountain View, CA). I had a similar dish as few years ago with chicken and black beans, and this dish was a variant on this theme. The rich sauce was perfect with the chunks of white meat chicken, melted cheese, and a handful of thin slivers of fresh onion. The raspberry margarita on the side provided some sweetness.